As we turn from July to August, tourism in Richmond is again seeing blockbuster occupancy rates at our local hotels, leading to an expanding visitor economy. According to preliminary data from CBRE, Richmond is leading the province in hotel occupancy at over 91% in the month of June. Summer data when released will no doubt show a tremendous leap in the occupancy rate through June, July, and August. Many of these visitors attended the Richmond Canada Day, Ships to Shore, and several other public events held in the city during the past few months. What does this mean for our tourism driven businesses in Richmond: opportunity; but like any business, our members and stakeholders must be prepared to take advantage of what lies in front of them. Our recently launched Cooperative Marketing Investment Program is one such program that is available to eligible participants. Another way to leverage the large numbers of visitors we are seeing is to attend our planned workshops around the city this year and next. We will be publishing a schedule of workshops in our monthly newsletter in the near future; please look for it as the workshops are an excellent opportunity to expand your business’ chest of tools to reach customers. We are also planning more Town Hall meetings, with the next meeting scheduled for Steveston on September 12 from 8:30 to 10:30 AM. This is an opportunity for members and stakeholders to learn more about what we have planned in the near term but more importantly, it’s a chance for you to tell us what you need from Tourism Richmond to help you achieve success. To RSVP, please click here. Later this month, we will be welcoming a new team member to the organization. After a thoughtful search, using the feedback from our one-on-one industry discussions with hotel sales directors from across Richmond, I am happy to report that Debbie Jager will join Team Tourism Richmond as our new Director of Sales beginning August 14. Many of you may know Debbie from the Vancouver Airport Marriott, where she’s been a sales manager with responsibility for corporate group and travel sales. She is a Certified Meeting Professional (CMP), holds a degree in Hospitality Management from the University of Guelph, and is currently enrolled in their MBA Program. Welcome Debbie! As we welcome one new team member into the fold, we say goodbye to another. 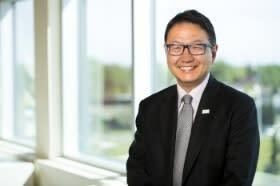 Colin Wong, our Director of Communications is moving to one of our key partners at the River Rock Casino Resort. We wish him well knowing that his move strengthens our relationship with one of the destination’s premier properties. I continue to meet with members and stakeholders throughout our destination but if I have not met you yet, please feel free to contact me directly at bokabe@tourismrichmond.com. I look forward to the thoughtful exchanges and feedback that many of you will provide.